Blog | Building Resources, Inc.
Upgrades to a rental property not only increase the value, but attract better potential renters. To increase retention and profitability, building owners will need to compete with neighboring properties. This means keeping the rental upgraded through renovation projects. Dull lighting can create a depressing feeling in a rental. Installing bright lighting will create a more open, cheerful, and welcoming atmosphere when showing the rental. Building owners should put in energy-efficient bulbs as well to cut down on electricity costs. Flooring is more likely to get damaged. Installing flooring that is durable and high-quality benefits everyone. It will make the unit look more polished and not need to be replaced as often. Most rentals have laminate due to it being cost-effective and highly durable. Old, worn out cupboards, countertops and appliances in the kitchen can date a rental property. Many renters appreciate a nice kitchen with enough storage space and modern countertops and will overlook other flaws in an apartment if the kitchen is comfortable. If the walls are faded or marked, it’s time for a paint job. Before painting, be sure to patch any holes in the walls. Also check the carpets for wear and tear and deep clean the carpets between tenants. Blinds shouldn’t be bent or broken and window screens should be intact. Deep cleaning between tenants should be standard. This includes sanitizing appliances and replacing the furnace filter if needed. When deep cleaning, take notice of the overall appearance of the unit. Is it time for a renovation? Contact Building Resources Inc. for rental property renovation needs. They specialize in construction and multi-family renovations, making sure to stay within the timeline and budget provided. They’ll make rental property renovations less stressful for the owner. There are a variety of materials available for the exterior of commercial buildings. The one chosen often depends on the intended appearance of the building, the upkeep it will require, and price of the materials. Each type of material has its own advantages. Read on to learn more about them. Wood can make a building look beautiful, but it tends to fade over time. Its life can be extended with regular maintenance. Maintenance often includes power washing, staining, sealing, and painting. Although the maintenance is significant, wood does look nice. 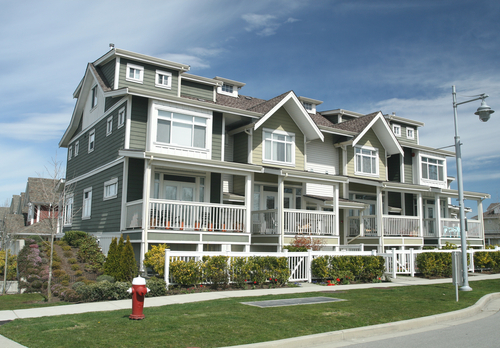 Once only used for residential buildings, siding is becoming more popular for commercial buildings as well. Vinyl is the most popular type of siding due to its low-maintenance, low-cost and variety of color choices. Two other options are aluminum and cement fiber siding. This material is tough, economical and is resistant to weather and impact. It minimizes street noise for those on busy streets. It’s also low-maintenance and comes in tons of styles and colors. Brick is timeless and requires minimal maintenance. Commercial building owners will have to determine whether the brick will be decorative or load bearing to select the proper materials. Modern brick does come in a wide range of colors and styles. Metal is a strong exterior material and requires little maintenance. It is fire-resistant and termite-resistant. It comes in a variety of finishes for all sorts of commercial buildings. This exterior material is the most durable. It resists fire, weather, and limits sound as well. When done properly, concrete can look inviting and less industrial. Commercial building owners who think their building needs an exterior uplift or those looking to build should call Building Resources Inc. Their experts will assist the building owner in choosing the optimal products for their building project. Basements are generally used for storage, instead of being used to their full potential. Building Resources Inc. can assist homeowners with converting the basement into something useful, like an in-law unit. Most of the time, basements have smaller windows that won’t conform to local building codes for basement bedrooms. Generally, they will need a safe, direct means of egress to the outside. If the basement is a walkout basement, egress can be provided by a door. If not, a standard basement window opening can be enlarged to install a larger egress-compliant window. When creating a basement in-law unit, privacy and soundproofing should be an important focus. One way to help with this is to enclose the bottom of the basement’s interior stairway with a door. This way, those living in the unit can have privacy, and not hear everything happening upstairs. Basements aren’t the easiest to keep comfortable when it comes to heating and cooling. Installing electric baseboard units controlled by a thermostat can be an economical way to provide heat. The basement’s foundation walls should also be insulated to help retain the heat. To make the in-law unit more independent, it will need a small kitchen. This should include a refrigerator, stove, oven, sink area, and microwave. It doesn’t have to be big, but it does need all of the useful elements of a normal kitchen. There could be some plumbing issues to deal with if there isn’t already a bathroom in the basement. If there already is a bathroom, changes are likely to be minimal. It will need a shower or tub if it doesn’t have one, and probably additional storage. If the space is going to be used for the in-laws to live in, installing grab bars and curb-less shower stalls during the renovation could prove very helpful later. If building an in-law suite is a possibility, talk to Building Resources Inc. about creating an in-law unit in the basement. They will make sure homeowners can use the extra space a basement provides to its full potential. Ease of operation: If they are hard to lift or slide when opening, newer windows might be a good solution. Condensation: If the glass collects condensation regularly, they probably need replaced. Cleaning: If cleaning the windows is difficult, consider getting newer ones that are designed to making cleaning easier. Single-pane windows are not the best for insulating a home. They let the cold and warm air in easier than double-pane windows. If homeowners have single-pane windows, they should consider replacing them with a double-pane option. They home will be more comfortable and their energy bill will probably decrease. If homeowners would rather repair their windows, they need to look at these factors to see if that’s the best option. Rot: If the windows are starting to rot, it’s basically impossible to stop it from happening. It’s easier to just replace them. Fogged double-panes: If there is fogging between the two panes, it can’t be fixed. Replacement hardware: Some hardware is hard to find even online. At this point it might be best to consider replacing the windows. The amount of air windows let in affects the heating and cooling system of a home. If the windows are old, rotting, and drafty, trying to fix them might not be the best option. Consider replacing them to reduce the amount of maintenance they require and help out the energy bill. Building Resources Inc. can replace windows in residential and commercial buildings in the Treasure Valley area. Renovating a storefront can breathe new life into a business and attract new customers. People are visual creatures, so if the storefront is looking a little drab, maybe even slightly rundown, it might be time to call Building Resources Inc. for a renovation. Consider putting in display windows or if they’re already present, increasing their size. Attractively displaying goods in windows is a great way to intrigue potential customers and draw them in. Use display windows to feature sale items or new arrivals. They can also be decorated for holidays and special events. Many shops use bright, colorful awnings to display their names and to attract people’s attention. Along with catching the eye of the crowd, they are useful for creating shade. The shade an awning creates could even help lower cooling bills during summer. Some storefronts go all out and create a theme. It can be incorporated into the window design, doorway design, awning, or outdoor sitting area. Depending on zoning codes, this could be an option when remodeling. Doors can also be used to show the personality of the store. Bright, colorful doors give off an exciting and playful aura, which can make people want to come inside. Heavier, wooden doors give off a more serious vibe. Glass doors are simple and let people see more of the store. While inside lighting is important, outdoor lighting also needs to be addressed. Outdoor lighting can provide many functions such as letting the address and name be visible, keeping away potential vandals, and spotlighting the displays from the outside. Whether it is a complete remodel inside and out, or just a facelift, Building Resources Inc. can get the job done. The Building Resources Inc. team works to minimize downtime and stays within the owner’s budget to create the renovation of their dreams. Many multi-family homes need renovated shortly after being purchased. After buying the property, get estimates for everything that needs to be done to the property. Building Resources Inc.’s main focus is multi-family properties when it comes to commercial renovation. They will be able to provide the owner with an accurate assessment of the necessary repairs. Massive changes are not always necessary to update the building. Often new flooring and paint can make a huge impact on the property. Sometimes buyers will want to go bigger by tearing down walls to open up rooms or possibly an entire kitchen remodel, but they should keep their budget in mind when making these decisions. Curb appeal is extremely important to drawing in potential renters. This is one main reason to make the front yard a priority ahead of the backyard. If there’s enough time and money, a nice backyard is a great benefit too. One of the biggest turn offs to potential tenants is odors. Odors can be related to mildew, pets, cigarette smoke, and more. Carpets often trap these smells, so if odors are present, start by removing the carpets and giving the whole place a good cleaning. Owners or their property managers should do routine maintenance and inspections of the property to keep everything clean and pristine. Clean shared spaces in the building such as hallways and remove any trash that might have accumulated. Also take care of the outside landscaping by trimming trees and bushes. Fix any appliances that just need a quick fix and some cleaning. If the appliance is damaged beyond repair, get rid of it. The replacement appliances don’t need to be the latest and greatest, but they should be clean and fully operational. There are times when multi-family properties might remain unoccupied. Units that look empty are more likely to attract vandals or unwanted guests. There are ways to make the unit appear occupied such as a radio to make noise or automatic lights. Be sure to check on the unit often for vandalism. As stated before, Building Resources Inc. specializes in multi-family renovations. The team works quickly and efficiently to minimize downtime for the owner. Multi-family home investors in need of a renovation team should contact Building Resources Inc. When purchasing a commercial building, it should never be assumed that the building is up to code. They should always be looked over to see if they meet code requirements. Commercial building codes were developed centuries ago to help ensure safety and to reduce incidents. These proactive safety measures help to protect those who work in the buildings as well as customers. Many of these codes are related to fire, plumbing, and other possible indoor issues. Because commercial buildings vary widely in type and occupancies, commercial building codes reference several classifications, providing functional and regulatory standards. Referring to the building’s fire resistance, each building is classified as construction Type I through Type V. Type I is the most fire resistant, while Type V is less fire resistant. Buildings are classified based on the function and risk associated with the building size. Next is the classification of use and occupancy designation. This is associated with the building’s purpose and identifies many critical code requirements for specific occupancies. For example, restaurants would have different codes than a factory or office building. Specific chapters in the code are dedicated to the structural performance and stability, fire resistance and protection requirements, means of egress and evacuation, light and ventilation, etc. Building codes are adopted by individual states or localities. However, most jurisdictions base their codes on a model code developed by standards developing organizations, like the International Code Council. The codes are based on scientific and engineering principles. Once they are published by the ICC, the “authority having jurisdiction” can adopt them into law in their state or community. When purchasing or constructing a new commercial building, the owner should be aware of these codes and verify that those doing their construction incorporate them into the design. Whether it is construction of a new building or renovating an old one, have Building Resources Inc. check to make sure it’s up to code. They can help ensure codes are adhered to in their construction or renovation plans. Apartments not only require cleaning and upkeep between residents, they should also be renovated when needed. Not only will it keep apartments looking nice, renovations will attract better applicants and give the property owner the ability to raise rent. While interior renovations are what most people think of, exterior renovations also make a huge difference. The first thing any potential renter views is the outside of the building, the parking lot, and everything surrounding it. If this looks dreary and unkempt, they will have a lesser opinion before even entering the building. Having updated kitchen appliances can have a huge impact on potential renters. They don’t need to be too fancy, depending on the neighborhood, but should be in working order and look like new. Bathrooms can tend to get dirty fast. Stained showers, bathtubs, and sinks can turn renters off. Having the bathroom fixtures refinished or replaced can make a difference. What property owners put into apartment renovations, they will get back through rent increases and more promising tenants. The nicer the apartment and higher the rent, the more bad applicants get filtered out. Building Resources Inc. has years of experience renovating apartment buildings and multi-family housing. They understand the importance of a timeline when it comes to these projects, as well as budget. Building Resources Inc. works to provide personalized services at an affordable price, making them a great choice for apartment building renovation projects. In an effort to reduce costs, building owners will try to manage the office renovations internally. This means they will hire individual people to do work such as a project manager, architect, trades, general contractor, etc. This can cause chaos and conflict, cause deadlines to go by and projects to go unfinished. With Building Resources Inc. building owners are getting the whole package. Their team will manage the renovation, with no inconvenience to the building owner. Staying within the budget doesn’t have to be difficult. Owners should consider many options when looking to save money on renovations. One of the first ways to do this is to look at the structure of the building to see if it can remain basically unchanged. If so, that’s a huge project that doesn’t need to be done. They should also consider a plan for optimal space utilization. Office building owners who are planning a renovation should be aware of possible complications and have a plan to deal with them, especially from a timeline standpoint. If a simple project turns out to be more difficult renovation because water damage or structural damage is uncovered, they need to be able to deal with a little extra time being taken for that project. With Building Resources Inc., the owners can go over a projected timeline and budget, which Building Resources Inc. will stay within. Building Resources Inc. understands the logistics of opening dates, third party vendors and scheduling when renovating office buildings or any other commercial building. Contact Building Resources Inc. when renovations are needed for multi-family buildings, office spaces, and more. Many homeowners choose to add on to their existing house instead of packing up and moving to a larger one. Finding a new home can be time-consuming and packing is usually an annoyance. However, adding on a room can have downfalls as well. Before deciding to add on or expand, homeowners should ask themselves a few questions. The cost of the addition will depend on the type of room, the size of the addition, and where the homeowners live. Redbeacon estimates that a ground level home addition typically costs an average of $32,614 in the U.S. A second story addition costs about $45,802 on average because it requires raising or rebuilding the roof. Building Resources Inc. can give the homeowners a good estimate of how much the expansion project will cost for their home. Can the cost be brought down? When a room is added within the existing footprint of the house, it can save homeowners a lot of money. Those who choose to add a room in the basement instead of adding on can save 25 to 50% percent while still gaining significant floor space. Another way to bring down the cost is to build a detached addition. These usually average $22,814. Some people decide to add a detached addition for an office or recreation area because it isn’t completely necessary for this type of space to be attached to the home. Additions of this nature are growing in popularity. Home additions will be noisy and possibly an inconvenience. This is especially true if it is a kitchen addition. The kitchen is likely to be unusable for at least a portion of the time during the construction so the family will have to prepare for that eventuality. However, Building Resources Inc. knows this can be challenging and tries to complete the construction as efficiently as possible with as little inconvenience as possible. After answering these questions, homeowners will have a better idea if an addition is feasible and worth the possible inconvenience. For more information and a project estimate, contact Building Resources Inc.